Couscous cooked in orange juice tossed chopped cucumber, dried apricots, scallions and mint, this citrus couscous salad with pistachios is a winner. Perfect for a light lunch. Or as a tasty side dish beside just about anything. We enjoyed it with grilled salmon one night and curried turkey meatballs the next. It’s definitely a light + flavorful vegetarian salad/side dish that I would make all year round. The original recipe called for whole wheat couscous, something I have yet to find in my market, so I substituted plain couscous with good results. According to my calculations each serving has 116 calories, *3 Weight Watchers PointsPlus, *4 WW Freestyle SmartPoints. Enjoy! 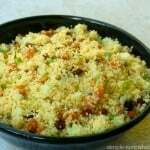 If you’ve made this Couscous Salad with Pistachios, please give the recipe a star rating below and leave a comment letting me know how you liked it. Light, healthy, and delicious citrus couscous salad with pistachios make a welcome accompaniment to a wide variety of dishes including grilled chicken, fish or vegetables. In a small saucepan combine the orange juice, water and salt. Bring to a boil over high heat. Remove from the heat and whisk in the couscous. Cover and let stand for 5 minutes. 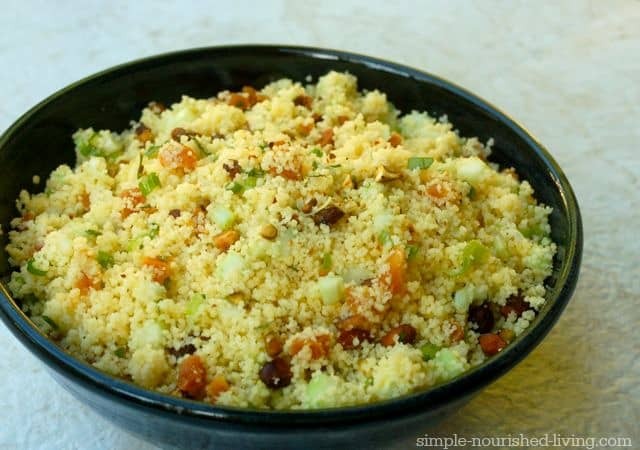 Fluff the couscous with a fork and then transfer it to a large bowl. Let it cool completely. In a small bowl whisk together the lemon juice and oil. To the cooled couscous add the cucumber, apricots, green onion and mint. Drizzle on the dressing and gently toss to coat. Sprinkle with pistachios. Season to taste with salt and pepper.